Electronics projects information's. This page under constant construction - development. White led projects including 5mm, Luxeon and Golden Dragon Led's. Simple drivers for LED's ( DC/DC Converters for Powering LED's). Single transistor Led driver for one to three 5mm Led's. Two transistor driver for one to three 5mm Led's. Three transistor driver with current control for six 5mm Led's. NEW!!! DC/DC Converters for Powering Luxeon LED's Torch. Driver from 1 cell 1.2 V or 1.5 V.
Torch Step-up drivers from 1-1.5V for Luxeon 1W / 300mA, with Zetex IC's ZXSC300E5CT or ZXSC310CT. Torch Step-up drivers from 2-3.8V for Luxeon 1W and 3W / 800mA, with Zetex IC's ZXSC300E5CT or ZXSC310CT. NEW!!! DC/DC Converters for Powering Luxeon and Golden Dragon LED's from 12V, 24V, 48V. Ideal for Solar powered house. Universal driver for Powering Luxeon and Golden Dragon LED's from 12V, 24V, 48V. Ideal for Solar powered house. Solar battery charger controller Sem1 and Sem2 with power module can switch up to 180A to 12 or 24 V battery. Laboratory Power Supply "Cool Power a&o 505" Single Output 0 - 50V, 0 - 5A. Projects : Published in Silicon Chip, Electronic Australia and Soft Technology - now ReNEW. Projects which I like to develop in future - Proposed project for future development. 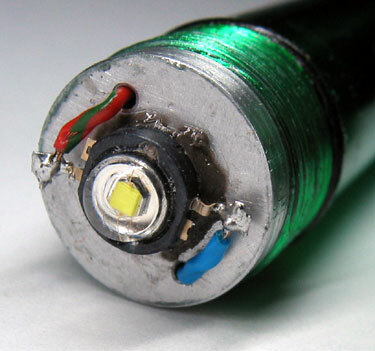 White LED torch driver for 1 & 3 x 5 mm Led's. Operates from 1 Alkaline / NiMH AA / AAA cells. Can supply 25mA to 1 or 3 LED's. >???? ?Measures 10.6 mm (??? inch) diameter x 6.7 mm (??? inch) height. Simple circuit use only 5 components. 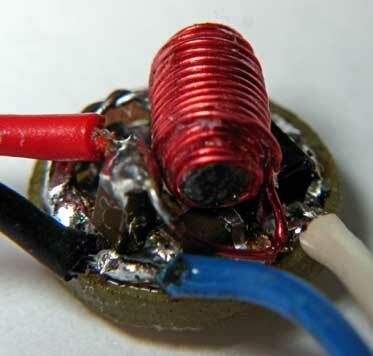 Components from single camera can be used transformer - trigger transformer (after rewind), switching transistor. 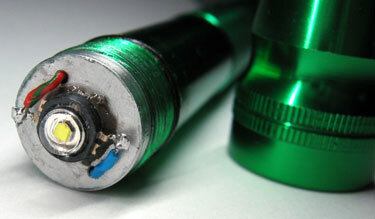 Components can be reclaimed from Computer Motherboards, Video cards, Hard disk drives - tantalum smd capacitors, diodes and ferrite RF rods. Transistor Q1 can be substituted with transistors reclaimed from Computer hard disk drives this all apply for capacitors. Note: Can be used components from single camera, transformer after rewind, switching transistor. 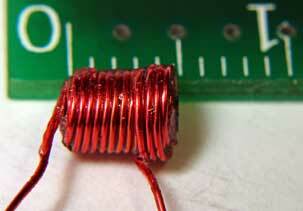 Can supply 25mA or more to string of 3 LED's. Current is adjusted with R before potting in epoxy. ???? ?Measures 10.6 mm (??? inch) diameter x 6.7 mm (??? inch) height. Looks like mess, tangled cooper wires. Note: Can be used components from single camera, transformer after rewind, switching transistor. Simple circuit use only 5 components. White LED torch 10 and 12 x 5 mm Led's. Operates from 2 Alkaline / NiMH AA / AAA cells. Converter can by made as 9.0mm diameter size if desired. White LED torch with 1W LUXEON . good for bush waking. with possibilities to use shut down pin for dimming control. With 2 AA 1600 mA NiMH batteries run time for torch is 2 hours. Test with 2 D 4000 mA confirm rum time of 8 hours. Image of PCB-Pil driver board. Image of 3 W Luxeon driver board. 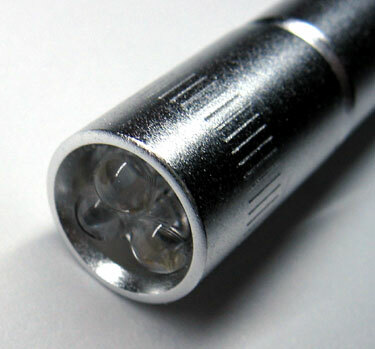 Image of 3 W Luxeon torch. This was checkout for facts and approved by ET. Please if you don't agree don't look. New prototype of driver for 1WLuxeon and 3 W Luxeon. Measures 10.6 mm (??? inch) diameter x 6.7 mm (??? inch) height. Each driver is tuned for best performance. ???? Each one will get a 10 minute burn in test so everything gets up to temperature. Image of 1 W Luxeon Mimi<300 driver board. Operates from 2 Alkaline / NiMH D / AA / AAA cells. (minimum 2300mA NiMh AA or D size sells recommended). Typical output 800mA from AA Alkaline cells (tested with 3W Luxeon and 3.0V Vin). Operating voltage range from 1.5V - 3.4V. Hand assembled circuit is tuned and tested. Input voltage maximum 3.2V !! !, can be design and tuned to accept V_in maximum 4.2V. Image of 3 W Luxeon Mimi<800 driver board. Measures 13.9 mm (??? inch) diameter x 6.7 mm (??? inch) height. Image of 3 W Luxeon Mimi>1000 driver board. Will drive 3x 3W luxeon in series. Used for in home lighting - solar powered house. NEW!!! DC/DC Converters for Powering Luxeon and Golden Dragon LED's from 12V, 24V, 48V. Ideal for Solar powered house. Sepic converter driver was chosen because it have ability to have low or high input voltage and same time drive one or six 3 W led's. This driver can be used in 12V or 24 V house lighting system and in emergencies can be used in car 12V battery. 24 V solar system and in same time in car. Universal Luxeon driver will drive 1 - 6 3W Luxeon III, (Luxeon K2) or Golden Dragon in series. Operates from 12V / 24V. Operating voltage range from 10V - 30V Maximum. Typical output 700mA - 1000mA. Output current adjustable by user. Pulse width modulation dimming. Dimming possible by adding trimpot. 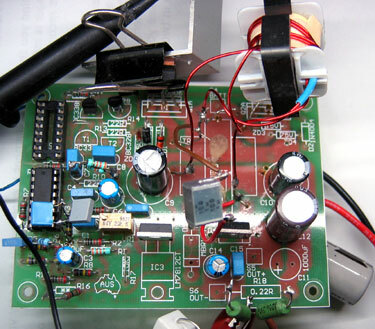 Operate from 10V to 30V Battery DC power supply or AC. For AC ad rectifier bridge and output filter capacitor 2200uF / 63V. Measures 146 mm (??? inch) x 67 mm (??? inch) height. Ideal Luxeon driver for Solar powered house, Car, Caravan or Truck. Note: Tested with 6 Luxeon III and can be used from 1 to 12 Led's. Driver for 1 - 6 Led's from 12V and 6 - 12 Led's from 24V 3W Luxeon III, (Luxeon K2) or Golden Dragon in series. I am using this driver in me 24 V solar house set-up. Universal Luxeon driver will drive 3 - 6 3W Luxeon III (Luxeon K2) in series. Operates from 24V / 48 V.
Operating voltage range from 20V - 60V Maximum. Operate from 20V to 60V Battery DC power supply or AC . For AC ad rectifier bridge and output filter capacitor 2200uF. Measures 106 mm (??? inch) x 67 mm (??? inch) height. Ideal Luxeon or Golden Dragon LED driver for Solar powered house. Solar battery charger controller Sem1 and Sem2 with power module can switch 120 A to 12 or 24 V battery. One switching module can switch 60 A, and use 6 Mosfets 60 A each on resistance 0.02R. Voltage drop its minimal. Battery voltage can be changed from 12 to 24 V just with removing link. SEM1 is Solar Electronics Module, which control power module PSM30 or PSM60 and switch the power source on and off as required. This is a very efficient method and can be used with alternative charging methods. You can configure solar regulator which 1x PSM30 for switching of 30A and you can connect 1 x PSM30 to 5 x PSM30. In other words you can expand of current handling of solar regulator in future and save money. 1x PSM60 for switching of 60A and you can connect 1 x PSM60 to 5 x PSM60. In other words you can expand of current handling of solar regulator in future and save money. Field selectable 12 or 24 Voltage. It can be supplied different voltages 36V, 48V. 1 LED status indicator for load disconnect ( 10.8V on 12V / 21.6V on 24V ) Red - ON . By using MOS circuitry and low current LED's, the quiescent current, and power consumption of the regulator is very low. It will work with 12V, 24V, 36V, 48V. lead-acid, deep cycle, gel cells, lead-acid car, truck or boat batteries. Right : Solar Electronics Module SEM1 assembled form. Image of SolarElectronics Module SEM2 SEM2 is Solar Electronics Module, which control power module PSM30 and switch the power source on and off as required. This is a very efficient method and can be used with alternative charging methods. You can configure solar regulator which 1x PSM30 for switching of 30A and you can connect 1 x PSM30 to 5 x PSM30. In adder words you can expand of current handling of solar regulator in future and save money. 1 LED status indicator for diversion of current from solar array ( via power diversion module or additional PSM30 ) to another battery or water pump, energy is not wasted. To prevent fast switching on and off introduced is time 2 minutes. LED status indicator for load disconnect ( 10.8V on 12V / 21.6V on 24V ) Red - ON . It will work with 12V, 24V, 36V, 48V lead-acid, deep cycle, gel cells, lead-acid car, truck or boat batteries. Right : Solar Electronics Module SEM2 assembled form. "Cool Power" from O.P. 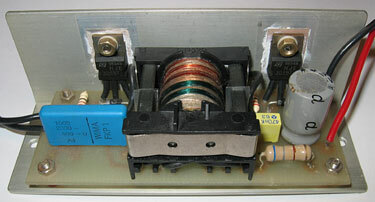 SOLAR , a&o 505 Single Output 0 - 50V, 0 - 5A. A new range of rugged, high specification power supply that have been designed for both the industrial and education markets. A versatile variable laboratory / bench power supply, capable of operation in both constant current and constant voltage mode with automatic cross over ; constant current or constant voltage is indicated by 2 LED's. Dual 3 digit Led display allow current and voltage to be accurately pre-set with the output switch in position "off" for voltage pre-set , and in position "set I (load on)" for current pre-set and the output to be precisely monitored with the output switch set to "load on". Voltage and current can be set by means of fine 10 turn potentiometer controls. Voltage to a precision of 100 mV , and current to a precision of 10 mA. Current limit may pre-set prior to a load being connected. LED's show whether the supply is operating in constant voltage or constant current mode. Power supply can operate in to short circuit indefinitely. By applying SCR pre-regulator voltage drop on regulating transistors remain approximately 7V. High quality, high power linear regulation. Low noise and excellent transient performance. Tree digit display of voltage and current. 0.1% accuracy, 0.1V Volt and 0.01A Amps resolution. Simultaneous metering of voltage and current. Voltage and current setting can be viewed prior to being applied. True constant voltage or constant current. Constant voltage and constant current indication (LED). (Constant voltage or constant current mode with automatic crossover). 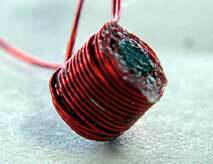 Power supply can operate in to short circuit indefinitely. Published in Silicon Chip January 1994 "Switching regulator for solar panels." 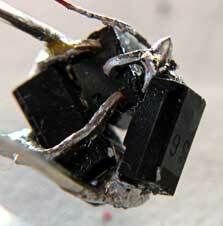 In the simplest solar panel plus battery setup, all you need is a diode to isolate the panel from the battery . This prevents the battery from discharging via the solar panel when it is not illuminated by the Sun.This is OK for a temporary setup but unless the solar panel is only trickle charging the battery , you will eventually run up against the problem of over-charging. Over-charging a lead-acid battery causes gassing, which can significantly reduce its life.To avoid over-charging the battery you need a regulator circuit so that the solar panel can charge the battery at its maximum current output until, reaches full charge. At that point, the regulator disconnects the panels from the battery and no further charging take place. The regulator can be build in two versions (10-amp or 20-amp) & can be used to charge a 12V or 24V battery bank. 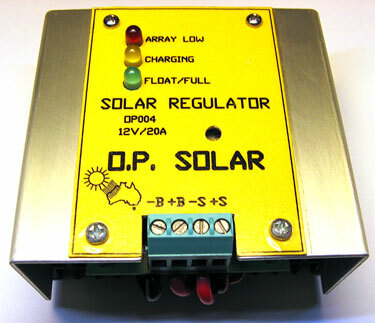 Solar Regulator OP004 is a switching regulator, switches the power source on and off as required. This is a very efficient method and can be used with alternative charging methods. Solar switching regulator is available in short form kit version. PCB OP008, on-board components , for price look PRICE LIST. We can also provide build up service for our kits. Published in Silicon Chip February 1991 "Three inverters for fluorescent light"
Fluorescent tube are one of the most efficient forms of electric lighting but because of their high voltage requirements their are rarely used unless 240V AC mains power is available. The particular attraction of fluorescent lights in these applications is that they are so highly energy efficient - much better than incandescent lamps. Yet are many applications where the high efficiency of fluorescent tubes could be highly useful. These range from portable emergency lighting to lighting for recreational vehicles, caravans, boats, and on homes and farms. In fact, if a pinpoint light source or a concentrated beam is not required, then fluorescent lighting should be the first choice, because of its efficiency. This inverter provide the necessary high AC voltage to drive a fluorescent tube from a 12V DC (24V/48V) supply and at a high efficiency. Sine wave - NO interference's. One fluorescent inverter for the range of fluorescent tubes from 5W to 2D 21W. Change tube has no effect on the fluorescent inverter. High frequency switching for low power consumption. Standard 12V / 24V DC ( optional 48V ) supply. This view shows the versatile fluorescent inverter 7W -16W. Electronics projects published in Australian magazines. Helium tube 5mW laser for laser light show. Three inverters for fluorescent light. Three inverters 1 universal from 7W tube to 2D 16W tube, 18W tube and 36W tube. 3 mW Visible laser diode pointer. 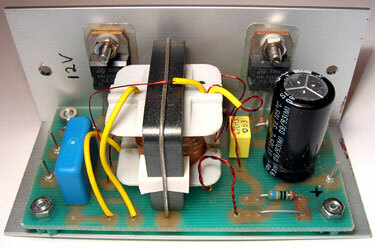 Build yours own 12V fluoro inverter. Universal 12 and 24V fluoro inverter. Switching regulator for solar panels. 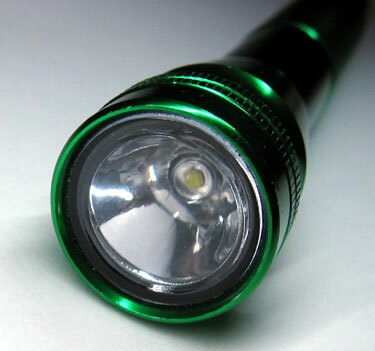 White LED torch with 3W LUXEON . Proposed project for future development. 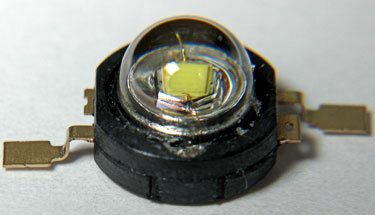 White led's Luxeon III, (Luxeon K2) or Golden Dragon. One option I'm considering is using Luxeon III and use 2 Zetex drivers either ZXSC300E5CT or ZXSC310CT. Only difference ZXSC310CTD shut pin can be used for dimming control. In this configuration I can use 1 driver for 1/2 power and 2 driver for full power. I tested ZXSC300E5CT and ZXSC310CT in this configuration and circuit can drive Luxeon 3W from 3V delivering approximately 800mA. Second option I'm considering is using Luxeon III and use step-down converter or microcontroller. Microchip have driver on they site. Buck Configuration High Power LED Driver AN874. The circuit is based on a buck topology switching power supply using the on-chip comparator peripheral within the PIC12F675 microcontroller. This microcontroller system can use only one switch and have 15 steps dimming control. Microcontroller based Sepic (Single-Ended Primary Inductance Converter) converter for driving Luxeon and Golden Dragon LED Led's from 10 to 32V, 1 or 2 strings of six led's. Dimmer control, light intensity sensor for constant light output, can be used with natural lighting and IR sensor with timer no movement switch off.. Linear technology manufacture of special IC's for driving Led's. Examples are: LT 1618, LTC 3215 - 700mA Low Noise High Current LED Charge Pump, LTC 3490 - Single Cell 350mA LED Driver. Sepic (Single-Ended Primary Inductance Converter) dc/dc converter for driving Luxeon and Golden Dragon LED Led's from 10 to 32V and if demand for 48V. Sepic was chosen for ability to work from wide range of input voltages. Solar power - Charger controllers. PWM solar battery charger controller for 12V and 24V battery bank and if demand for 48V. PWM solar battery PTM charger controller. Proposed LED's driver project for future development. As you find out some of the project are already on this page. < 5mm LED's Drivers for Lighting. Used for white , red, yellow. > Simple but reasonable efficient driver for 5mm Led's. Single transistor driver for 1 and 3 LED's. Two transistors driver for 1 LED. Two transistors driver for 6 LED's. Four transistors driver with current limit for 6 LED's. < Luxeon 1W and 3W Drivers for Torch. > More powerful drivers for Luxeon III, (Luxeon K2) or Golden Dragon. Zetex driver for 1W Led's. Step-up from 2-3V. I_out 350mA and 400mA to 500mA. Zetex driver for 3W Led's. Step-up from 2-3.8V. /Bootstrap/ I_out 500mA to 700mA. Sepic Zetex driver for 1W Led's. From 1.5-7V. /Bootstrap/ I_out > 300mA. Sepic Zetex driver for 3W Led's. From 1.5-7V. /Bootstrap/ I_out > 300mA. < Luxeon 3W Drivers for Solar Home Lighting. > Universal driver will drive 3 - 6 3W Luxeon III, (Luxeon K2) or Golden Dragon in series one or two strings. Luxeon drivers from 12V; 24V; 48V. For 1W, 3W. / 1 - 6 Led's one string and two strings for 2x 6 Led's. Drivers based on TL494 or SG3524. Drivers based on Microchip microcontroller. Drivers based on ONsemi.com PWM IC's MC34063A & MCV33163. 12 - 24V Sepic design (universal V_in) V_in 10V - 30V. Driver for 1 - 6 and from 24V 6 - 12 3W Luxeon III, (Luxeon K2) or Golden Dragon in series. 24 - 48V Sepic / Push-pull design (universal V_in) V_in 20 - 60V. Universal Luxeon driver will drive 1 - 6 3W Luxeon III, (Luxeon K2) or Golden Dragon in series. Drivers based on TL494 and SG3524. Dimmer control for driver or dimmer control included in driver. Zetex based 12/ 24V driver / and dimmer control. # After experience with sepic driver I will reconsider development of this design. Any logo, trademark and project represented here are property of their respective owner.